_ _ One of the last nights out on the town with my boyfriend before he deployed to Afghanistan, we found ourselves at a bar in Colorado Springs that served buckets… yes, buckets… of booze. In honor of this great country, Nick decided to get the bucket with “red, white and blue” drink in it (whatever deadly concoction that consisted of). As he and his friend drank from the bucket, they became increasingly possessive of it and began telling people that they would NOT share, because they were defending “Amurrica”! I’m also fairly confident he got a couple of hapless bar-goers to salute the Amurrica bucket… Nick didn’t appreciate it when I asked why he was pronouncing it that way… He’s from Connecticut. _ _ As the 4th of July approached I became increasingly excited to make a ton of BBQ-style food, and in turn, increasingly depressed as I realized that I still don’t have enough friends in Colorado to have a proper get together. So, much like my Valentine’s day this year, I invited Ana over to be my little guinea pig for some new recipes. Nothing makes me feel more American than over-consuming, watching cable TV while I digest, and then getting terrible road rage as I try to find somewhere to park and watch some patriotic fireworks! Hooah. NOTE: if using puff pastry for the crust like I did, you’ll want to bake these right before you want to serve them because reheating causes the pastry to get a little chewy. 1. In a medium sauce pan, add the blueberries, lemon zest and lemon juice and let them cook down over medium-high heat until the juice from the berries is thick enough to coat the back of a spoon. 2. In a small bowl, mix the cornstarch with the cold water until it’s completely dissolved. Add the cornstarch mixture, sugar and salt to the berries. Stir until it’s all combined and remove from the heat and set aside while you assemble the pie crusts. 3. Roll out the thawed puff pastry on a lightly floured surface until it’s slightly thinner (approximately 1/8 inch). 4. Turn the pie pans that you’re using (I used mini aluminum pie tins, but I originally wanted to use small glass mason jars… if you can find them that would be adorable) upside down on the pastry and use the rim of the pan to guide you as you cut out 4 circles. Take a sharp knife and cut some slits in TWO of the 4 circles. 5. Press one pastry circle (one without the slits cut into it) into the bottom of each tin and prick all over with a fork. Divide the blueberry mixture between the two tins. 6. Brush the edge of the pastry with the beaten egg. 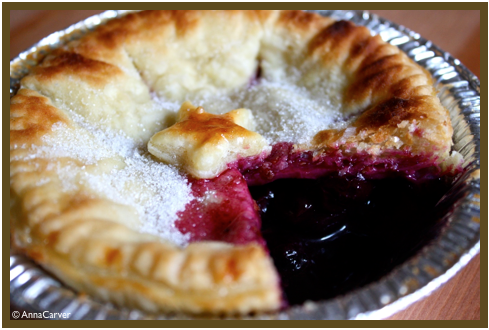 Place a circle of pastry (with the slits) over the top of the berries and use a fork to crimp the edges down. Sprinkle the top with a little more sugar. *Note: I also used a star cookie cutter to cut out little shapes from the remaining puff pastry scraps and brushed both sides with the egg, then pressed them down on top of the pie. The egg helped it to brown a bit more than the rest of the pastry crust so it stands out. 7. Place the pies on a cookie sheet and bake for 15-20 minutes, until the crust is getting a nice golden brown. Remove from the oven and serve with a little scoop of vanilla ice cream or whipped cream! Awww I wish I had been here for the 4th, i would have gladly been your guinea pig! Pick me pick me!!!! Haha you are so clever to use puff pastry for the crust. I often want to try to make pies (lately I’ve been wanting banana cream pie…) but the choice of either buying the hard premade crust, or struggling over making my own deters me every time… You are genius! And these pies looks so juicy and freaking delicious!